It feels like we’ve done these stories for over a decade now. Sadly, the golf world listens and we’ve had to watch various businesses flush years of credibility, service and solid profits in a quest to reach this precious audience while neglecting others in the name of pursuing the previous M’s. Certainly there are issues for the sport, but you’d hope by now that the focus would shift from all that the sport is not able to achieve for the M’s and accept that golf is not the cause of issues preventing millennials from having the time or income to spend on a leisure activity. Or even pay their taxes. Of course he’s not totally wrong on the values front, but we do know the industry has made huge changes in recent years on multiple fronts. Not to time it takes and probably not diversity, but golf courses are definitely not smelling like a “chemical factory” either. "New York Lawmakers Tee Up Tax Bill That Takes a Swing at Golf Courses"
Thanks to all who sent Keiko Morris’ Wall Street Journal story on a New York bill to give local governments the option to assess and tax golf courses based on “highest and best use”. Morris suggests the bill could be the undoing of many golf courses. Business owners and industry representatives fear the measure would usher in tax hikes for many facilities, prompt closures of courses and hurt local tourism and hospitality markets at a time when the sport faces stiff competition to gain more fans. The bill’s Democratic sponsors, Sen. David Carlucci and Assemblywoman Sandy Galef, and proponents say it is about golf courses, especially country clubs with high-end amenities, paying their fair share of taxes. The bill may have been inspired in part by fights with the Town of Ossining’s valuation of Trump National Westchester ($14 milion) vs. the Trump organization’s estimate (10 percent of that). The club was valued at over $50 million by President Trump in federal financial disclosure filings. The other course feuding with Ossining is Sleepy Hollow. The club’s attorney says its market value is $20. That’s twenty, as in 2-0. I hopefully slipped in as much detail as possible regarding a busy week for Augusta National as a venue. Slower greens appeared to make the difference in faster play, while the new 5th almost played tougher than the 13th and 15th. And the 11th hole is still a complete affront to the philosophy of Bobby Jones and Alister MacKenzie. Read all about it at Golfweek.com. Sam Weinman explained the bizarre correlation between Woods success and the markets six years ago. Are we headed there again? As the 2019 Masters became a whirlwind affair, I wasn’t able to keep up with all of the amazing content. The Masters.com folks debuted a Masters podcast that even debuted and is queued up for me to keep savoring this year’s event for days to come. I will selfishly start by posting my walking tour of the course, a walk I traditionally make on the weekends before settling in the Press Building (see map above…it starts at the clubhouse and goes up No. 1). The walk allows me to see all but the 4th, 5th and 12th hole locations up close and to get a sense of the wind, vibe and other conditions. This year I was only able to do it Saturday and it took longer than normal, but generally it takes about 40 minutes and is a great way if you get to the Masters to see the entire course setting in a folding chair or grandstand. The video was the idea of the Masters.com team to accompany my essay designed to settle most general questions about how to get the most from a Masters visit. Naturally, it was an honor to share this and I hope it’s handy for years to come if you get the privilege of attending the Masters. "Tiger Woods Showed He Was Back Not With a Shot, but With a Stare"
Screen capture from Masters.com’s leaderboard clips. There are going to be so many moments from the 2019 Masters worth reviewing since it all seemed to happen in a blur. The birdie at 3, the entire 12th hole, the drive at 13, the tee shot at 16 and the final two tee shots jump out. But the New York Times Bill Pennington highlighted one moment that has been under-appreciated in the analysis of the stunning 12th hole events: Tiger marching on ahead to the green as Francesco Molinari and Tony Finau dealt with their shots landing in Rae’s Creek. 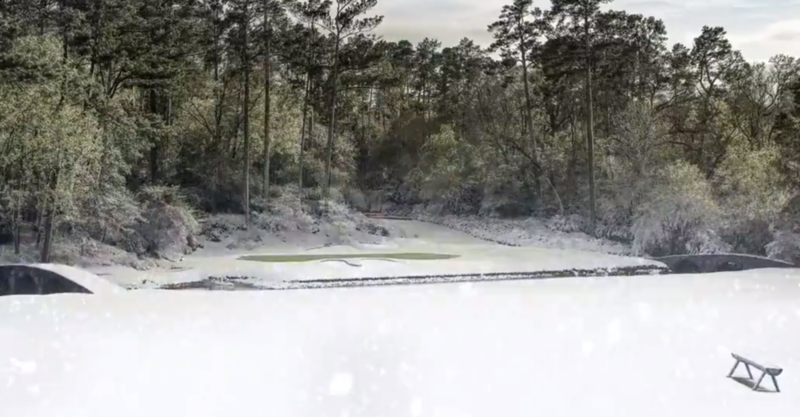 Thanks to the camera view from behind the tee, we could see how Tiger make sure to do some green gardening, requested blowers to move pine needles, and in general, was prowling around to remind his competitors he was on dry land. We’ve always wondered if the new, kinder Woods would ever regain the edge that made him different. Sunday’s 12th hole scene confirmed the master intimidator and artful practitioner of selective gamesmanship had his mojo fully restored. Q. For those of us watching, 12 seemed to be the seminal moment. When Francesco's ball went in the water, did it change anything you were thinking? Was it always going to be over the bunker, center of the green? TIGER WOODS: That's all I was concentrating on. I had 47 over the first tongue in the bunker there, and so my number, I was hitting it 50 and just be committed to hitting it 50. There's a reason why ‑‑ I saw Brooksy ended up short. Poults ended up short, as well. And so I ‑‑ when I was up there on the tee box and it was about my turn to go, I could feel that wind puff up a little bit, and it had been something ‑‑ Brooksy is stronger than I am, and he flights it better than I do, so I'm sure he hit 9‑iron and didn't make it. So I knew my 9‑iron couldn't cover the flag, so I had to play left, and I said, just be committed, hit it over that tongue in that bunker. Let get out of here and let's go handle the par 5s, and I did. Yeah, the mistake Francesco made there let a lot of guys back into the tournament, myself included. I had to scramble deep outside Augusta city limits to find some Chronicles, already sold out at most locations by 8 am. But I’m pleased to say one was acquired as was the New York Times and USA Today. I’m biased, but USA Today is the most frameable, if I’m Tiger. There is much to mull from the 2019 Masters and posts will be flying to picking this masterpiece apart, but in the meantime I thought I’d share a fun story in hopes of hearing some of your “where were you” when Tiger Woods held off a huge cast of stars and future stars to win his fifth green jacket. A friend of mine gathered with his neighborhood buddies and watched the final round in a garage converted into a mancave, with the door open to the street and everyone free to stand, roam, smoke, cheer, eat and watch the broadcast. To which he was informed about tee times having been moved up and the round complete, with Tiger Woods winning. Loss of blood from the face ensued and there was the inevitable look of horror. Mercifully for him, CBS replayed the round from the 12th hole on. And it can be relived on Masters.com, or on CBS Sports Network Monday night at 8 pm ET. Feel free to post any lively or wacky where-were-you stories and other viewing anecdotes of note, if nothing else for the archives when we celebrate the 25th anniversary in 2044. He’s all the way back. Remember, this didn’t seem like it was ever going to happen again. And now 2019 may join 1960, 1986 and 1997 on the Rushmore of epic monumental years in Augusta. Let’s save that debate for this week. I’ve just filed a few pieces for Golfweek and USA Today’s print and digital editions, but who needs sleep. Let’s go. Steve DiMeglio’s USA Today game story. Bill Fields at Masters.com opened with the 16th hole, where Tiger last put a Masters away in 2005. Here’s my completely not humble explanation for why I picked Woods at the beginning of the week and how he prevailed by going all Hogan on us, not worrying about chasing those FedExCup points and, as he said early this week, peak four times a year. Will Gray captures the scene behind 18th as Tiger worked his way to victory. David Dusek also walks among the patrons and tries to capture the sense of excitement at Augusta National. Dan Kilbridge was out with Tiger all day and has some of caddie Joe LaCava’s reactions to the win. Brian Wacker addresses the inevitable question now: is 18 majors back in play. Key interviews were after the round in the Press Building, and this second—SECOND—Butler Cabin interview with Jim Nantz and Nick Faldo thanks to the early start and Tiger’s return before CBS began a final round rebroadcast. Here is 10 minutes of press conference video, not all but most. Masters.com video of Butler II here. A Golfweek roundup of Tweets, including Jack Nicklaus’ congratulations and many other luminaries from sport and politics. The weird Sunday start will be a footnote in the history books, but it still is worth considering how it impacted the event, writes Dave Shedloski. Here is the lowdown on the gum. Yes, I asked but the rest of the answer about what gave him a sense of calm and confidence is ultimately more interesting. The images are stunning, as you’d hope for a historic Masters. The Masters.com gallery is here and focuses on the 18th hole scene and aftermath. Golf Digest’s team of Furore, Cuban and Iooss captured some beauties here. The Augusta Chronicle’s image gallery is also worth your time. They also put up this separate gallery of the impromptu outdoor jacket ceremony originally cancelled. The Masters Instagram story from Sunday was outstanding with some never-before-seen moments from after the win. Get it while it lasts! The entire final round is now online for viewing here. A huge rating for CBS Saturday seems more like it for a Tiger telecast from Augusta, making ESPN’s ratings decline even more bizarre. CBS Sports’ third-round coverage of the 2019 Masters on Saturday, April 13, is the highest-rated Saturday golf telecast on any network in four years since 2015’s Masters third round (6.5/16). Yesterday’s coverage earned a ratings increase of 5% from last year’s third round (5.7/13) with a 6.0/15 average household metered market rating/share. This year’s third-round rating peaked with a 7.0/16 rating/share from 6:00-6:15 PM, ET. Winter is coming in more ways than one. It’s a Sunday unlike any other and we sure hope this early start never happens again. With potentially extreme weather coming around 2 pm, the players will have to move quickly, an near impossibility in threesomes and windy conditions. Saturday was an epic in terms of scoring, reports Christine Brennan. The field was 80 under par, the scoring average the lowest for a third round (70.769) and yet, the field was the largest to make the cut (65). Amen Corner Live and other feeds are live. So enjoy! My five wild scenarios for Golfweek consider the range of possibilities. Assuming we crown a winner, there will be no Green Jacket ceremony outdoors. The Masters meets Game of Thrones. Whoa. Instant Poll: Who Will Win The 2019 Masters? Here they are (and ties). Vote away! And set those alarms for some early morning golf, as the last group will tee off at 9:20 am ET, usually the time members are just sitting down for a veranda breakfast. Guess the Tiger factor isn’t what it used to be, or streaming is eating into overall numbers, or Masters streaming has caused a downtick? Or all of the above? ESPN’s telecast of the second round of the Masters Tournament on Friday, April 12, averaged 3.2 million viewers as golf fans tuned in to watch a charge by Tiger Woods on the second nine highlighting a fierce battle of golf stars at the top of the leaderboard. The telecast aired from 3-7:45 p.m. ET from Augusta National Golf Club. The 3.2 million average, based on Nielsen Fast National data, was ESPN’s second-largest audience for the second round since 2013, exceeded only by the 3.9 million that watched last year. The viewership average does not include the rain delay that halted play from 5:03 – 5:34 p.m. on Friday. Friday’s audience was up significantly from 2017 (2.6 million) and 2016 (3.0 million), the last two years that Woods did not compete in the Masters due to injuries. It also was higher than 2015 (3.0 million, with Woods in competition) and 2014 (2.5 million when Woods missed the Masters for the first time in his career). For the second day, the Greenville-Spartanburg, S.C., market led the nation’s metered markets with a 5.0 rating, up from the 4.6 rating in the market on Thursday for the first round. Other top 10 markets for Friday were Ft. Myers/Naples, Fla., 4.7; Minneapolis-St. Paul, 4.2; Raleigh-Durham, 4.1; Buffalo, 3.7; Indianapolis, Columbus and Cincinnati, tied at 3.4; and Tampa-St. Petersburg and West Palm Beach, tied at 3.3. You’ve surely seen it by now, an officer doing his best Chase Utley impersonation almost took out Tiger Woods in the name of well-intentioned but slightly overzealous policing of the patrons. Golf.com’s Dylan Dethier talked to the poor lad, who is just happy Tiger capped off the hole with a birdie. So many wacky things happened Friday that we still mustn’t let Zach Johnson’s practice swing gone bad go forgotten. Oh, and besides an S-bomb from Zach—understandable—it’s a teaching moment about intent and the rules, writes Doug Ferguson. I spent the latter parts of Friday’s exciting final round reading weather reports for this weekend’s violent storms and as Jim Nantz noted during the broadcast, the situation is ominous given an added element: high winds. I do not envy the committee’s job given all of the logistics involved and unpredictability of weather, but as I lay out in this Golfweek column, no change in the bleak forecast and this leaderboard should make the call relatively easy: postpone the final round to Monday.